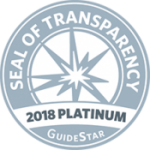 Patient Advocate Foundation (PAF) earned the 2018 Platinum GuideStar Nonprofit Profile Seal of Transparency, the highest level of recognition offered by GuideStar, the world’s largest source of nonprofit information. By sharing metrics that highlight progress PAF is making toward its mission, the organization is helping donors better evaluate and compare nonprofits by providing tangible insight into the impact of the organization’s services and interventions. “This is the second consecutive year that PAF has received this platinum distinction and it directly aligns with our long-held belief in being able to demonstrate the impact of our work both qualitatively and quantitatively,” said Beth Moore, EVP of Corporate Communications. “We are excited to have this opportunity to share our organization’s results in a user-friendly and highly visual manner and honored to be a GuideStar Platinum recipient. To reach this level, PAF included extensive information on its GuideStar Profile – including in-depth financial information; qualitative information about goals, strategies, and capabilities; and quantitative information about results and progress toward its mission” added Moore. About GuideStar Nonprofit Profiles: The GuideStar database contains a profile for every tax-exempt nonprofit registered with the IRS. GuideStar encourages every nonprofit to claim and update its profile at no cost to the organization. Updating allows nonprofits to share a wealth of up-to-date information with the more than 8 million people who visit GuideStar to learn more about nonprofit organizations each year. Updating also allows nonprofits to share information with the more than 200 philanthropic websites and applications that are powered by GuideStar data. To reach a given participation level, organizations need to complete all required fields for that participation level. The GuideStar participation levels, acknowledged as symbols of transparency in the nonprofit sector, are displayed on all updated participants’ profiles in the GuideStar database.